I got a ticket yesterday. Not a ticket to a movie or an off-Broadway show, or a ticket to see Paul McCartney, or to see Tom Petty touring for his new album (I mean CD) which is not leaving my car stereo for a long time. I got a traffic ticket for the first time in 20 years. Amazingly, a New Orleans cop decided that in the middle of an underpopulated city chock-full of abandoned houses now serving as meth labs and crack dens, it was critical for the safety of the community to enforce one of the city's arbitrary "No Right Turn" signs**, especially if no one was coming in the other direction and if the perpetrator was driving a diesel Volkswagen Golf full of dirty laundry, pink house paint, cat food, groceries, diet soda, yarn, and pointy sticks. Even more amazing, he was mean. We're talking loud, patronizing, strident, sarcastic, Catholic-gym-teacher, down-and-dirty, Marine-drill-sargeant mean. This cop stomped right up to my window and barked like Cujo into my left ear: "I need to see your license and registration right now! Did you know you made an illegal turn back there?!?!" Well, actually ... yes. But. Technically, the light has to be red for it to be illegal to make a right turn on a red light, and for the light to be red it has to be on, and, because of Hurricane Katrina, that particular traffic signal hasn't been on for soooooooooo long that area residents have become quite accustomed to Australian rules for traffic in this particular part of town. So even though the light has been restored recently (very recently, I might add), myself and other folks are still in the habit of doing what we have done for the past ten months or so -- approach the intersection, look left, look right, look up, look left again, and turn if no one is coming. Which is exactly what I did. And besides -- while it may have been downright dangerous to make an illegal right turn at that particular corner before Katrina, well ... let's just say that nowadays you could conduct a sizeable Tai Chi class in the middle of that intersection without any major liability concerns. I am not contesting the legality of my turn. I did turn when it was safe to do so, but, after months of feral driving in a devastated city, it is hard to break a survival habit overnight, and that sort of turn has again become illegal because the light is now working, and, in fact, I do so turn thusly. I just don't understand why he was so mean about it. Speed was not an issue (trust me, considering the condition of the streets). And he only had to chase me about 62 feet to the Burger King driveway. Maybe he had once been shot at by an irate driver, or maybe it was not his own personal idea to be on traffic duty yesterday. Or, perhaps it was his first day out of police academy, and all he got for his first big bust was a middle-aged knitter with bad knees driving a compact diesel. That can be embarrassing back at the precinct house. Maybe he has no one at home who loves him enough to knit him socks. Or maybe they were simply out of Krispy Kremes at the 7-11 where he was lying in wait behind the Dumpster. It is also possible that the Dumpster juice was extra-stinky yesterday. Exceedingly fragrant Dumpsters have been known to happen in New Orleans. I can understand a person being grumpy about having to sit next to one all day. Tant pis. One ticket in 20 years. I don't think my State Farm agent will drop me over this, but it is momentous enough to merit a photo, being fetchingly displayed by a super-basic stocking cap done in exactly one skein of Noro Kureyon on size 7 needles. Chapeau Pattern: using a set of five sock needles, cast on 8 stitches over four needles. Using the make-one increase, increase one stitch at eight evenly-spaced points every other round, until you have enough stitches to go around your head, based on the number of stitches per inch you got in your gauge swatch. Change to 16" circular needle of same size and knit round and round in stockinette until you have a golf-ball sized amount of yarn remaining. Change to 16" circular one size smaller, knit until two yards remain, bind off, weave in loose end at bottom. Return to top of hat, thread cast-on tail through 8 cast-on stitches, draw snug, weave in loose end. You can do this during a movie on TV. Voila, un chapeau. 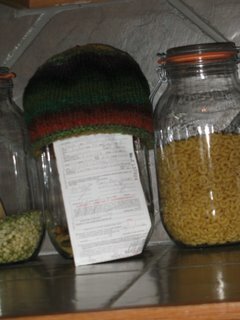 If you are more clever than I am, you will wash and block your hat before you put its picture on the Internet, and you might even put it on an actual head instead of a gallon glass jar with noodles in it. **I find it remarkable that there are ANY illegal right turns in a city which is almost entirely devoid of LEGAL left turns. Exactly where are you supposed to drive, eh? I can top that one, Dez. I know someone who got a ticket for failing to stop at a stop sign. So? says you? Well the aforementioned stop sign served a completely unguarded rail crossing. Once upon a time a train trundled from Adelong to Gundagai (country towns) twice a day. This friend was a local and knew that the train had been replaced by a bus, TWO years earlier, the rails had been taken up by the railway people, but the Road and Traffic Authority had not yet got around to removing the Stop sign. But that didn't faze the Highway Patrol cop. But at least the Infringement Bureau listened to common sense, and may have even got a laugh out of it. Took at least another year to remove the stop sign. PS you're going to get me knitting again, I just know it...!!! I find myself in the remarkable position of having to explain "Australian Rules" to an Aussie! "Australian Rules" is an American term which means something along the lines of, "no rules, survival only." Common sense should prevail (as in turning when the traffic signal is broken) but you may use teeth and claws if you have to. It is usually applied to extremely amateur athletic events, like a game of football organized at a picnic. If you are playing Scrabble and someone declares Australian Rules, you can make up words, provided you also make up a definition. Some people have to knit, some other people have to be be mean. Sounds like one of those kind had slim pickins because his normal pickins aren't back home yet. You were apparently the only morsel he could dig up in a pinch. Hee, I'm back ... see, 'Australian Rules' in Australia is a code of football. Also known as Cross-Country Ballet. You see my confusion :) Thanks for the explanation.